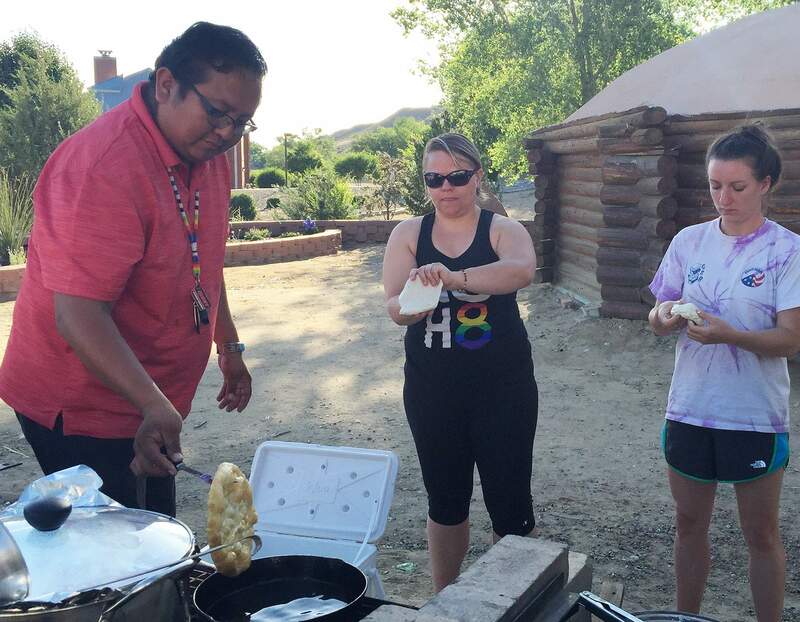 Leland Becenti, a graduate of the Four Corners Master of Social Work Program, demonstrates how to make frybread for Lizz Mueller and Casey Sims on the grounds of Navajo Preparatory School in Farmington. The demonstration is part of an immersion course developed to prepare social work students to work in Native American communities. Social work students must learn a variety of disciplines – public health, psychology and law, to name a few – but learning empathy and how to respect cultures may be one of the most important lessons learned. To help students acquire those skills, Denver’s Graduate School of Social Work in Durango offers a 10-day immersion course that allows students to work in Native American communities alongside professionals who can help them learn to respect and understand cultural traditions and social norms. Students shadow community health representatives working with Navajo patients near Window Rock – checking their health status, medicines and food. The class is one of three offered as part of a master’s degree program at the Four Corners Master of Social Work Program to help prepare students to work on reservations by helping them understand Native American history and culture. “Native clients today are still carrying around the legacy of the past that hasn’t been healed,” said Nancy Lucero, who has a doctorate in social work and taught and developed courses for the program. While the need in some areas is pressing and change is slow, Lucero advises young social workers to be realistic about what they can accomplish and to create a safe space for Native Americans to share their experiences. Listening to clients may not change their circumstances, but allowing them to share their stories helps. “What I think they are talking about is this deep human need to connect and have someone witness your pain and struggles as well as your hopes and your strengths,” she said. In some cases, social workers are associated with those who forcibly removed children from Native American homes, and changing that stigma is important, she said. “You can change their experience through building authentic interactions with them,” she said. In general, social workers fill many of the same roles in a tribal community as they would in other settings. They could work in hospitals, clinics, justice systems, mental-health and substance-abuse treatment programs, among other settings, Lucero said. 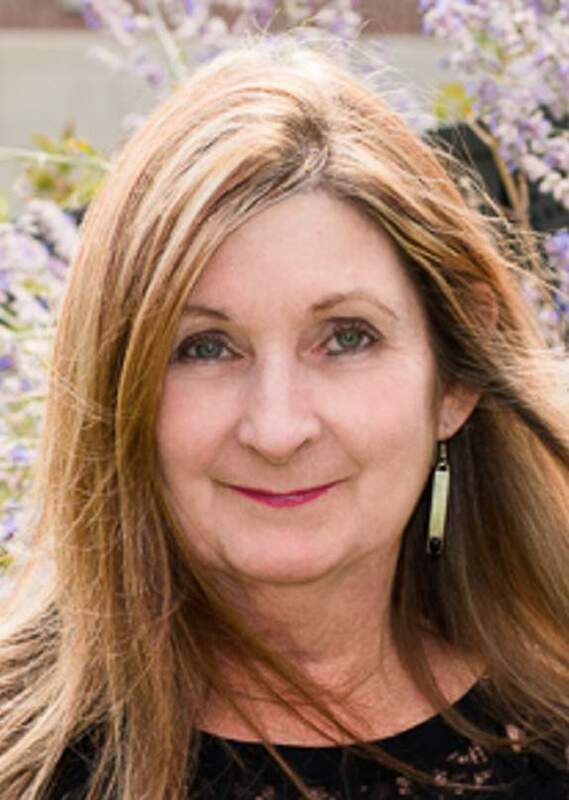 The need for classes focused on Native American cultures was identified in the early 2000s, and they are now part of the draw for students, said Wanda Ellingson, director of the Four Corners Master of Social Work Program. “We have students from across the country who are coming and visiting the program,” she said. Classes are held in The Commons Building on Camino del Rio. The program accepts 25 students every two years and 150 students have graduated from the program. So far 29 percent of the graduates are Native Americans who returned to work in their communities. The immersion course is the latest addition to the school’s offerings. Students visit the Ute Mountain Ute, Southern Ute and the Navajo reservations. They also attend learning experiences developed by former DU social work students working in those areas. The first class developed for the program, called Native Peoples Practice: History and Policy, covers federal policies aimed at Native Americans, including genocide, forced assimilation and tribal sovereignty, among others. The school also offers an assessment and intervention course focused on working with Native Americans. The policy course is a requirement, because it is key for those who want to work in social work, Ellingson said. Many students have not learned much Native American history and find it shocking. “Students go through almost a development stage where they become very, very angry at the education system for not making them aware of native people and the issues that were going on,” said Lucero, who is a member of the Mississippi Choctaw tribe. “It’s probably the brutality of the boarding school system that elicits the biggest emotional response,” she said. Native Americans are still feeling the effects of those policies and the corresponding cultural loss, and in some ways, colonization is still occurring, she said. For example, when Native Americans live on large reservations and have access to food from only convenience stores, their situation is not terribly different from those Native American living on rations in the 1900s, she said. While learning Native American history can be overwhelming for some students, it can also foster an interest in working with Native American tribes, Lucero said. The program in Durango prepares Native Americans students to fill social work roles in their home communities, but people of other cultures are also needed, she said. Janelle Doughty, who is both Southern Ute and Navajo, was one of the first graduates. She went on to work in social work for the Southern Ute Indian Tribe and the Ute Mountain Ute Tribe. She helped develop coursework as a member of an advisory council and plans to co-teach the upcoming immersion course this summer. She describes her own cultural experience as learning to walk between three worlds and encourages teaching those skills. For example, in mainstream culture, it’s acceptable to ask for what you need directly. However, Navajos will tell you a story that will allude to what they need, she said. “It’s a roundabout, polite way to get to the point,” she said.